Ceramic and metal braces are traditional ones. When it comes to shape and size, ceramic braces are the same as metal ones. But every single ceramic brace is larger than its analog of metal braces. It’s explained by the necessity to compensate for their weakness and brittleness. The design allows the ceramic braces to withstand pressure which appears during tooth movement. Traditional metal braces are more noticeable and cheaper than ceramic braces. You can choose clear or tooth-colored ceramic braces with bands which color matches your enamel color and what makes them less visible. In respect to aesthetics if you wear ceramic braces it will be more comfortable for you. They need appropriate care but it’s not easy to stain them despite the current opinion. It’s hard to maintain ceramic braces so you’ll have to visit a dentist often. But with them you’ll forget about irritation of your gums. Metal braces are more durable and stronger than ceramic ones. They rarely break. Ceramic brackets are tough but metal brackets can withstand much more pressure and more types of treatment. It is technological advances, ceramic composite and high quality that makes ceramic brackets more expensive than metal ones. In comparison with metal braces ceramic ones look more aesthetic and nicer. The clear ligatures (the clear elastic wires) can be stained by certain drinks and products (coffee, tobacco products, tea, curry, cola, or juices). So a mustard or blueberries aficionado can prefer metal brackets with a darker ligature. If you wear ceramic braces, treatment will last much longer. A dentist changes elastic bands monthly. Whether a dentist recommends them to you or not also depends on your tooth anatomy (including a bite). Excessive wear can be caused by ceramics touching your teeth. Neither types of braces will allow you to avoid discoloration. 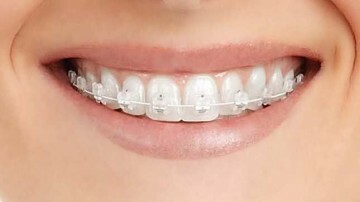 Ceramic braces will give you unique experience and confidence since it’s hard to notice that you’re wearing them (especially at a distance). Meanwhile, a metal archwire can be visible to others.